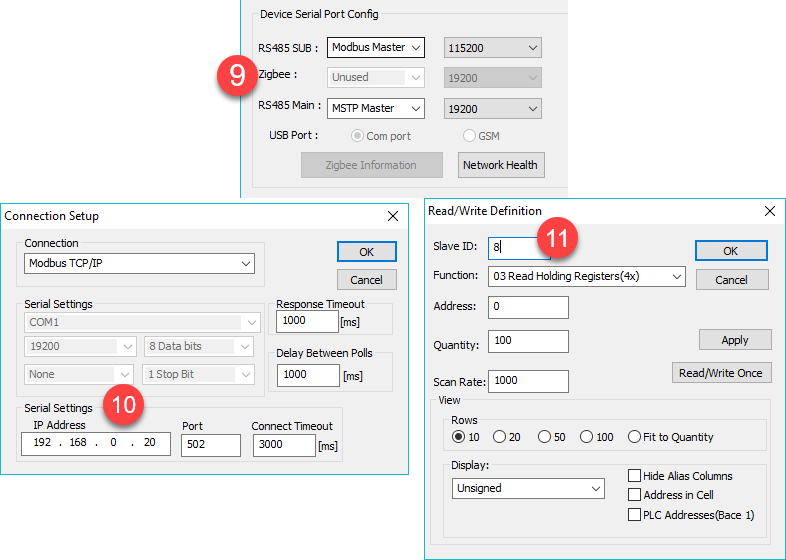 Here is an overview of the typical scenarios for referring to remote Bacnet and Modbus devices in the T3000 programming environment. For the two T3 controllers on the Ethernet lan at tabs1 and 2, we use programming lines 1 and 2 to read data from another controller. VAR1 = 2IN1 where 2 refers to any other panel ID on the lan. Special note about bacnet AI, BI, AO, BO naming: You could also refer to the bacnet equivalent, VAR1 = 2AI1 but you have to be aware of the range. If you switch any item from analog to binary your program may need to change as well. When you use the T3000 internal naming convention, INx, OUTx and so on, you don’t have to worry about the range setting. There will be situations where you need to address i/o on a remote lan, this isn’t supported for now. The Chiller at tab3 is a modbus device connected to the LAN, it is planned to support the programming shown in line 3, as in VAR2 = 30MB_REG1, in the near future. Drop us a line if you have a project that could use this. The VFD showing at Tab4 is an example device, a variable speed drive from Honeywell which supports bacnet protocol over the LAN. If the device at Tab4 supports “Bacnet IP” or BIP protocol you can directly refer to the Bacnet objects in this device by their Bacnet instance and object number. The program at line 4 shows the simple example, VAR1 = 400AI1 where 400 is the bacnet instance and AI1 is a typical bacnet object on the VFD. Where the numbers 500 and 600 refer to the bacnet instance of the two devices. The AI1 refers to any of the various bacnet objects supported by the devices: AI, BI. AO, BO and AV are supported in the programming. 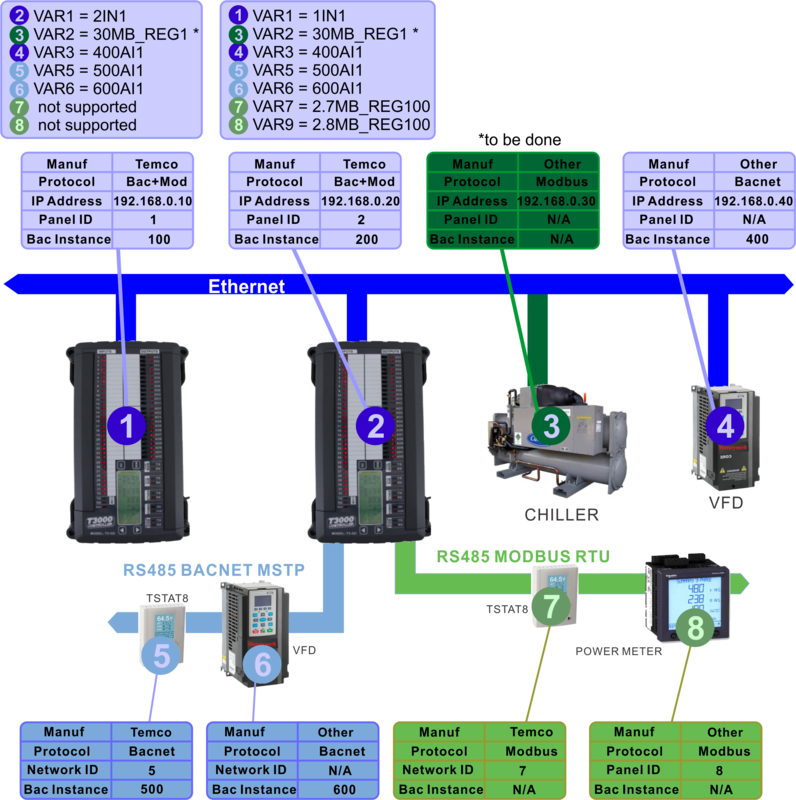 Notice how the programming for all the bacnet devices is the same no matter where the programming is done, whether in Panel 1 or Panel 2, the lines 4, 5, and 6 use the same structure. And the same goes for the network layer, whether the device resides on the main Ethernet Lan or RS485 subnetwork. This is the strong point of bacnet, we just have to know the bacnet instance and the T3 controller takes care of the routing behind the scenes. The MB_REG command is used to refer to the modbus registers of the device, the numbering system uses base 0. Only the master controller at Tab2 can refer to these modbus subnet devices in the programming directly, if you find the need to use data from the subnets in a program residing on device #1 you can refer to VAR7 and VAR9 as described earlier in the T3 to T3 example. Note that data can flow well using standard bacnet and modbus programming on any of these networks from 3rd party devices, the above examples show how to program and integrate from within the T3 controller programming environment. As an example of 3rd party modbus integration, the T3 will transparently route Modbus packets in gateway mode from the chiller at Tab#3 to the power meter at tab #8 for a load shedding application. The Modbus TCP protocol provides for a “Network ID slot” in each TCP packet for the ‘network ID’, if the ID is a match for the controller #2 it will reply directly, otherwise it will pass the message on to the subnets and the subsequent reply back to the Lan. No setup is required to take advantage of this feature except to configure the T3 subnet as modbus master at Tab9. The other screen shots at Tabs 10 and 11 show the Poll definition setup from a typical Modbus polling program, as you would set it up to poll the device at Tab8 from the Ethernet lan. One more note about Modbus subnet routing, the Modbus TCP ‘network ID slot’ mechanism means that we cannot talk to a controller with ID=2 on the subnet of a controller with its ID=2, the controller will reply itself. Can’t read CO2 data from CO2-D-TH sensor on Ethernet LAN. 10 VAR1 = 164AI3 got value after some time (next day), but i tried other sensor (146, 147), and again 0 value. In Network point table i see only one have Object instance, other sensors do not have Object instance, i guess this is a problem. Can i enter Object instance somehow, or use Object instance not ip to address devices? Your hunch is right, use the instance number and you’ll be good to go. We’re slowly phasing out the ‘Panel ID’ and IP addressing scheme that was in use for a while there and may be showing up in some threads & documentation, the Bacnet instance number makes things simple and clear. About network programming, we support use last byte of IP address or instance. for exapmle, the device’s IP is 192.168.0.100, and instance is 12345, we can use 100AI3 or 12345AI3 to read AI3. Note: The IP address method of addressing network points has been getting bogged down with other use cases. We’ll migrate away from this method and will be using the ‘Panel ID’ for proprietary (one T3 controller to another) transfers. For Bacnet flavor network transfers we’ll use the instance number. For modbus network transfers to 3rd party devices, the thinking is we could consider using the entire IP address, all 4 octets. Open to suggestions on this. That is best way to address Temco CO2 sensors in IP network? IP or Instance? Instance works well for other devices, not so well for Temco CO2. Somtimes it works, sometimes it doesn’t, at some point CO2 146 and CO2 145 was working well, and CO2 147 wasn’t. Situation today is different, I got readings from 145 and 146 and 147 still not working.